This class extends Starling's Mesh. Is like using Canvas actually, but with optimized geometry for the rounded corners. Get MeshRoundRect the gist here. // or instead of ::radius, modify each corner separately. Here's Material Morph Demo (110kb, no preloader), showing the MeshRoundRect in action, Tweening all values constantly. It uses random colors from the Material Design color's palette, and tweening randomly the elevation (z) for the Material Shadow. That's why it has high draw calls, but sometimes a delay kicks in that shows the cache in the dropShadow filter. MeshRoundRect doesn't smooths the corners radius (like graphics.drawRoundRect()) beyond the defined width/height, so the corners are always 1/4 circle. Kudos, easy to use, works like a charm. @indra, MeshRoundRect uses invalidation when you change the properties, so it will render the next frame. I just updated the gists code, adding a "validate()" method, pretty much like Feathers does. As I understand it, the gradient fill does not impose on them? It has far more than four vertices; looking at the code it has a few at each corner, normally more than four, so setting the first four vertex colours will colour in a very small slice in one corner. You could try colouring in all the vertices at each corner. It does not keep track of how many is at each corner, but you could add code for that, or work it out based on the size of each corner. Each corner has x4 vertices... and they are triangulated Starling's Polygon class, so the indices are all actually "interconnected". In a simplistic approach to colorize the vertices, wrong results. Is way simpler to use MeshRoundRect as a mask, or go with a RenderTexture and blendMode ERASE if u have multiple instances. As long as the vertices are coloured in sensibly, so e.g. the top corners one colour, the bottom corners another, then it won’t matter how it’s triangulated as it will interpolate properly top to bottom across all the triangles. The triangulation only becomes important when the vertex colours don’t correspond to a sensible gradient. E.g. a quad made up of two triangles. If you colour opposite corners the same (so topleft + bottomright one colour, the other two another) you will see the edge that separates the two triangles as it will be coloured the same as two of the vertices. But with colours sensibly arranged, such as here, it does not matter how it is triangulated, whether in a quad or a more complex mesh. Maybe there's another way to select which vertices to colorize and make the gradient more smooth. It might still show up some of the triangulation near the corners, especially if they are large. To deal with that you need to colour in vertices according to where they are. E.g. 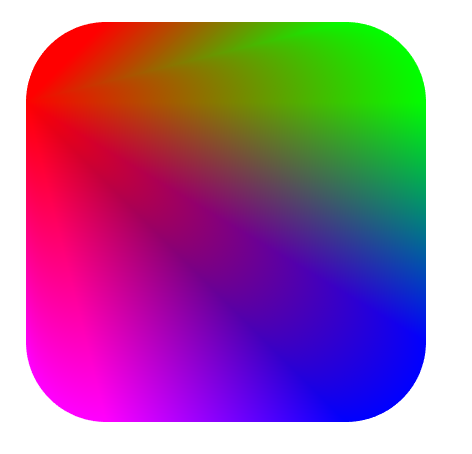 if the blend is from top to bottom then vertices should be coloured depending on their y position. To avoid all that you could just draw a white rounded rect to a RenderTexture. Then create and Image from this, and colour the four vertices of it to tint the Texture for the blend. Is like if u have 9 different quads rendering the image. Thats why the object that u draw in the render texture should have the gradient applied. I also think that you need to draw an object with a gradient, otherwise there will be no meaning from this gradient. I'm sure drawing rounded rectangles with a gradient is a big step for design.